Financial Transactions Tax Introduced Again—Can It Pass This Time? The tariff on transactions would cost the average investor little while deterring risky high-volume trading—and Jack Lew seems open to the idea. 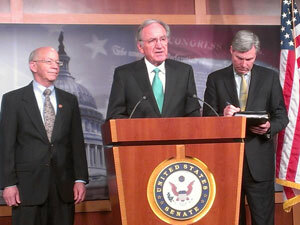 Representative Peter DeFazio and Senators Tom Harkin and Sheldon Whitehouse (left to right) announce a bill to create a financial transactions tax on February 28, 2013, in the US Capitol. Photo by George Zornick. Just like the Congress before this, and the one before that, the 113th Congress will have a financial transactions tax to consider—and its backers are confident that, this time, they can make it law. Thursday morning in the US Capitol, Senators Tom Harkin and Sheldon Whitehouse, along with Representative Peter DeFazio, announced the latest version of a tax on Wall Street trading: it would place a small tax of three basis points (that is, three pennies for every hundred dollars) on most non-consumer trades. Senator Bernie Sanders is also a co-sponsor of the legislation, as are nineteen members of the House. If enacted, the tax would generate $352 billion in revenue over the next ten years, according to the Joint Committee on Taxation. It would apply to traded stocks and bonds, derivative contracts, options, puts, forward contracts, swaps and other complex Wall Street instruments. It would not cover the initial issuance of any stocks or bonds, nor covers or loans in the form of stock. Three pennies per one hundred dollars would not be noticeable to most retail operations and average Americans—someone with a 401(k) balance of $60,000 (the median in the United States) would pay $18 per year in financial transactions taxes under this bill, and it contains a tax credit to cover the cost of the tax for contributions to tax-benefitted pension, health and education plans. The sequestration and continuing resolution fights present another opportunity to wedge a Wall Street tax into the discussion. If Republicans eventually come off their intransigence against raising any new revenue, they will be looking for ways to do it while lowering rates, and the transaction tax presents a great opportunity to achieve that. “I have to ask, what other options are there for raising $350 billion with such a negligible impact on middle-class Americans and Main Street businesses?” said Harkin. A staff turnover at the White House has also encouraged the bill’s sponsors. At Thursday‘s press event they shared some of their experiences with past administration officials, including some details that were not public until now. DeFazio noted that in 2009 Obama was “very interested” in a financial transactions tax, but said “unfortunately it was assigned to Larry Summers and Timmy Geithner, who were both absolutely opposed to it, and they deep-sixed it and never brought anything back to him.” (This was reported in Ron Suskind’s book Confidence Men.) “Well, they’re both gone, thankfully,” said DeFazio. The odds are still long for a financial transactions tax in the United States, given Wall Street’s enormous power in Washington, but there’s little doubt that at least the landscape is shifting in a favorable way. And if Congress does enact it, it won’t be the first time—there was a financial transaction tax on all stock transactions until 1966. Congress actually doubled it in the 1930s. A major corporation helped pay for Obama's Inaugural Ball—and bought itself a nice favor down the road, George Zornick writes.